Above: On March 25th astrophotographer Pablo Lonnie Pacheco Railey of Monterrey, Mexico, obtained this wide-field photograph of Comet Hyakutake showing its tail stretching tens of degrees across the sky. (If you click on the small image above, you'll pull up a larger, 35K jpeg file.) This image was graciously supplied by Kosmos Instrumentación Especializada, whose staff translate our Weekly News Bulletin into Spanish every Friday afternoon. Copyright © 1996 Pablo Lonnie Pacheco Railey. COMET HYAKUTAKE, also known as C/1996 B2, proved to be the brightest comet since Comet West in 1976 and the brightest one to appear in the evening sky (when most people are out to look) since Comets Arend-Roland and Mrkos in 1957. But at last the comet has faded below naked-eye visibility. It is now a binocular target during evening twilight for observers at north temperate latitudes. After making its closest approach to the Sun on May 1st, Comet Hyakutake will slip into Southern Hemisphere skies. The comet appears extremely condensed; that is, its brightness is highly concentrated toward the middle. Seen with binoculars, it's a little glowing fuzzball with a tiny star in its center. Under dark skies, during the comet's close approach to Earth in late March, countless naked-eye observers reported that its coma (head) was 2 degrees or more in diameter and that they could make out a tail as long as 30, 60, or even 90 degrees. Some observers said they recognized the very pale aquamarine color distinctive of comets. (47K gif) Georgia amateur astronomer Tim Puckett made this portrait of Comet Hyakutake in late March using a 135-mm lens and ST-6 CCD camera. Remember that a comet does not shoot across the sky like a meteor, though its motion against the starry background can be discerned from night to night. Also keep in mind that a comet's tail always points in the direction away from the Sun; currently the Sun is below the west-northwestern horizon at nightfall. This means the tail will extend upward, leaning a little to the right. Finder charts (B&W;, 39K gif); (Color, 57K gif): These charts track Comet Hyakutake's position among the stars, with the orientation of its tail, from late March through late April. (The B&W; version is provided for ease of printing.) The stars and horizon are correct for viewing in North America at about 10 p.m. standard time in late March, 10 p.m. daylight saving time in early April, and just as the sky becomes fully dark in late April. Venus is by far the most brilliant starlike object you'll see in the west; it too moves slowly against the starry background. The crescent Moon joins the scene in the third week of April. APRIL 25-28. Scan low in the northwest every clear evening right around the end of twilight. Note dazzlingly bright Venus, the "Evening Star," which will be your landmark for finding Comet Hyakutake while it's still in the northern sky. The comet is to the lower right of Venus by about three fist-widths at arm's length. Its head is now so low that you'll need a good, open view of the northwestern horizon. You'll also have to look a little before twilight fades out completely. Bring binoculars! APRIL 29 and later. The comet swings closest to the Sun (21 million miles) on May 1st, but by then it has become hidden in the Sun's glare. After its solar flyby ("perihelion"), the comet swings rapidly south; it never comes back into view for observers at mid-northern latitudes. 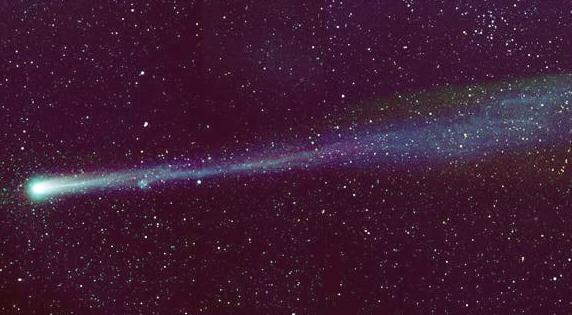 Rapidly fading, it becomes an object for Southern Hemisphere astronomers in mid- and late May. By summer it will have dimmed to telescope-only visibility. Alan MacRobert is an Associate Editor of Sky & Telescope magazine and an avid backyard astronomer. Copyright © 1996 Sky Publishing Corporation, All Rights Reserved. For more information contact Sky Publishing Corp., P.O. Box 9111, Belmont, MA 02178-9111, USA. Phone: 1-617-864-7360. Fax: 1-617-576-0336 (editorial only), 1-617-864-6117 (all other).